1. Mix the dry ingredients flour,baking powder and baking soda and keep it aside. 2.Whisk the butter and sugar together then add the egg beat well. 3. Add the yogurt ,vanilla essence and banana. 4. To this add the flour whisk well without lumps. 5. Add the chopped walnuts and bake in greased loaf pan in preheated 350 f oven for about 6o minutes. Check with knife or tooth pick inserted in the middle. If comes out clean its perfect. 6. Cool and slice it for serving. 1. I some time add 2 tbsp of cocoa powder or choc chips for variation. 2. You can add fresh or dried blueberries too. 3. Add raisins with some other nuts. That would be great if I could have a few slices for the breakfast tomorrow! wow you even make a simple banana nut bread look so pretty! 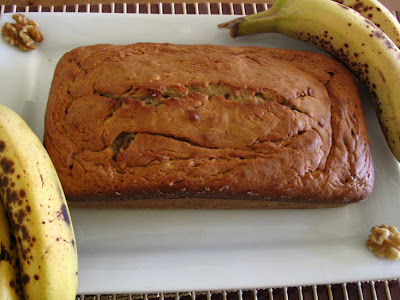 Banana bread is on my List from so many days! Wow..Delicious amd moist looking banana bread.Luved the presentation also. Yummy it looks. I have never had banana bread so far :( will try soon. Anni, when do we add the banana to the batter??? and should we blend the banana in mixie before adding?? I also made banana nut muffin today and took photos, couldn't get any ideas to present them. You are really great dear, what ever food you cook you present them so well. Hats off. congrats on the award..and hmmmmm..loved the first click...nicely presented....lovely recipe too..
Lovely presentation...I follow an eggless recipe for this. Banana bread looks so delicious. That should be a very flavorful one! ur bread looks fluffy and mosit..looks tempting.. I too made banana bread last week,but my son didn't eat ,he said it tastes like banana,he he..i liked it,urs look perfect and moist,great presentation as usual and congrats on ur award..
Thats a lovely bread. Always love the aroma from the banana bread. wow looks great Pavithra!! !Congrats on the award! Banana bread looks too good! Great way to start a day! Congrats Pavithra on the award.Nice click for a yummy bread yaar. Another beautiful looking dish from your kitchen! Aww delicious! Perfect banana bread! Great pic's of the bread, looks yummy! The slices look so perfect and delicious. 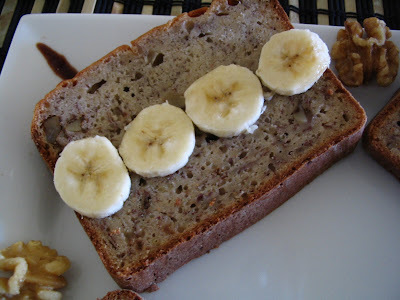 love banana bread..have u tried the bana chocolate chip bread?..thats my new favorite!! 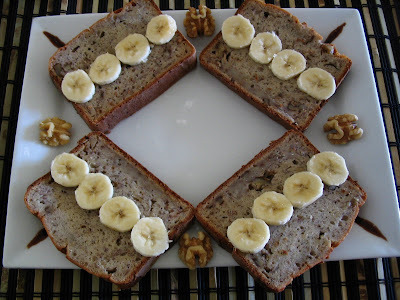 delicious banana bread...it looks perfect! Lovely presentation Pavithra..Love the first pic..:)!! that looks perfect and yummy!! Congrats on the award. That banana nread looks awesome.Why is the bread brown color? It looks yuuuuuuuummmy and delicious. congrats dear on your award . Yummy bread loved it . Check my version of the bread when u get a chance . Looks soft, moist and delicious. hmmmm yum yum yum !